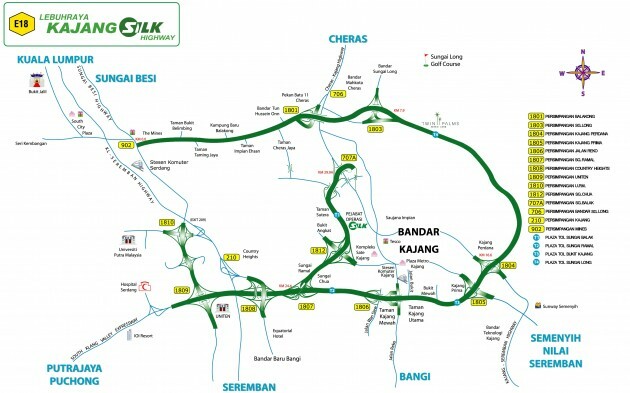 Alongside the other toll hike announcements made by a number of highway concessionaires today, Sistem Lingkaran-Lebuhraya Kajang Sdn Bhd, the operator of the Kajang Dispersal Link Expressway (SILK), has announced that effective October 15, the toll rate structure for the Kajang SILK Highway will be revised. The new rate structure by class of vehicle for travel on the 37 km-long highway, which was built to disperse and regulate the traffic flow in Kajang is as follows: RM1.80 for Class 1, RM3.60 for Class 2, RM5.40 for Class 3, 90 sen for Class 4 (taxis) and RM1 for Class 5 (buses). This is an increase of 80 sen for Class 1 (currently, RM1), RM1.60 for Class 2 (currently, RM2), RM2.40 for Class 3 (currently, RM3) and 40 sen for Class 4 (currently, 50 sen). The rate for Class 5 remains unchanged – buses are charged a rate of RM1 presently. The E18, which starts at the Mines Interchange near Seri Kembangan and ends at the Sungai Balak Interchange, began operations in 2004. Malaysia, Malaysia, Negara Yang Jaya !!! I am happy to give. Pls don’t complain here. Be grateful you are living in a safe and secure country!